The supreme is a firm-flex deck made of Bamboo and pre-tensioned fiberglass. 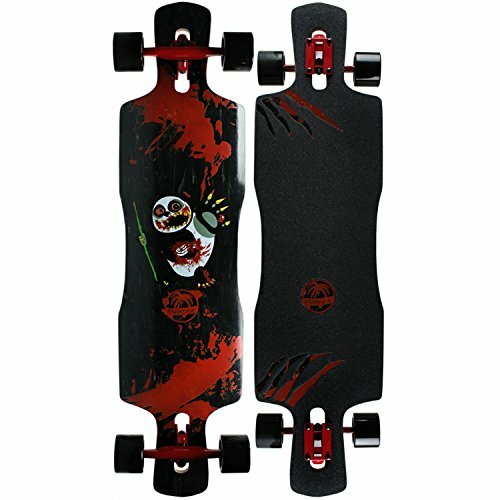 It features twin kicktails, radial-dropped platform, 3 Stage rocker and our mean-cave which fits smaller feet or those looking for a tighter concave. STRONG & LIGHT: Stronger than steel and light like a feather, the Rayne Longboards Supreme Deck has a firm flex to let you drift and thrash, a 3-stage rocker for fast, precise slides & easier spins, and a radial drop platform that’s ideal for freeriding. BOARDS FOR EVERY RIDER: Rayne Longboards prides itself in producing longboards and accessories for every rider. Whether you grind, cruise, carve, dance, slide, drift, freeride or downhill we’ve got the decks, wheels, pucks, griptape and gloves you need! ECO-FRIENDLY QUALITY: Rayne Longboards is committed to creating the best, premium longboards and accessories from eco-friendly materials and processes. We use reclaimed, recycled, or upcycled materials whenever possible, so you can keep your grind green. PREMIUM LONGBOARDS: Rayne is a premium manufacturer of longboard skateboards for downhill, freeride, dancing, carving & freestyle longboarding. At our North American factory we use the best eco friendly materials to build the best longboards in the world. TRICKED OUT LONGBOARDS: See what makes a Rayne longboard a step above the rest by comparing Rayne’s products to brands like IMPORX, Linkin Sport, Sector 9, Loaded Boards, Triple 8, YOGOGO, Bern, Andux Land, Rayne, Landyachtz, esKape, Pro-Tec, or Losenka.